We are excited to announce a new concept in swim coaching! BareFish will be launched on 1st July as the culmination of 6 years of research into helping people to unlock their best swimming. As a pre-launch special offer we are giving free online coaching throughout the month of June. Click here to sign up to our mailing list and we will send you more information! How can I learn better swimming? I do , I am riding my BMX for the first time without training wheels. Until now it was safe, the bike always kicked back when I tried to tilt over to far, the training wheels bent at ninety degrees proof as my dad removed them. 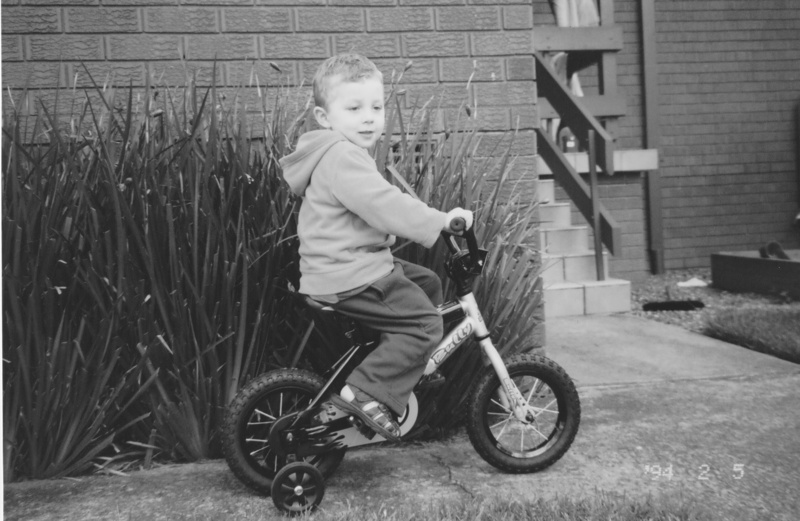 No matter what dad told me, drew pictures of, even demonstrating how to ride the bike the only way I was going to be able to learn was to try it myself and see what happened. The time was now, “pedal, pedal, pedal” he encouraged as he pushed me along then releasing the seat. The wind in my face, the cracks in the footpath whizzing by, the wobble of the seat the shaky handlebars, ahhh crash. That happened a few times, next time I would do something different. How many attempts it took I really don’t remember but I got it. I was riding like the big kids were, two wheeled, footloose and free. Swimming is the same, no matter what you see being done, what you read, what someone tells to do, unless you get in and try it for yourself you can’t really know how it feels. It’s funny and sad that as we become adults that through schooling, conforming to rules and standards, becoming more intellectual we forget the child within. Looking back at being a kid the most learning happened in the first 10 years of life. As babies shoving things into your mouth to relate to objects. Toddlers touching hot stoves to see what happens, as 5 year olds climbing tables, trees, benches anything. There was no questions or contemplations, we learnt by doing, trying, experimenting. As an adult when we try something new we want to know what is going to happen, how do we do it perfectly the first time, why we do it this way or that and how will I look while I do it? I am fully aware of the different ways people learn, kinesthetically, visually, verbally and so on. The biggest breakthroughs in a person swimming that I witness when coaching is when that person feels safe to revisit that child. What does that mean? When the environment supports you being in your body, in the sensations, in the feelings. I can tell you to get more streamlined when swimming, that you need to hang your head or your hand, even demonstrate what I want to see. Until you play with these things yourself and feel how it makes you slip through the water instead of dragging through it, you will never experience how good being streamlined can feel. I get one swimmer ask me why are we doing this, what degrees do I hang my hand, can you show me again what you mean? In the meantime another swimmer is trying it, feeling it, experimenting with it, being it. By the end of the session that swimmer has realized a big breakthrough it what being streamlined feels like and translates to in their swimming. The original swimmer is still working it out, sure they’re in the water but they are also outside their body and in their head. wondering why they haven’t had the same “light bulb” moment. Similar to learning to ride my BMX, I didn’t get it right the first time, or second, I did keep trying, kept experimenting and I got it. Those crashes didn’t always give me the perfect result, but they weren’t a waste. In fact they taught me what I was doing well and what I needed to change so I wouldn’t crash next time. So when I got it I knew why, I knew how, I felt what perfect was, I didn’t need to ask. I invite you next time before you next jump into the pool to visualize a similar experience from your childhood. Hope in the pool as that kid and experiment with your swimming. You just might be surprised what your learn. Are you thinking about taking part in a triathlon but put off by the swim leg? Every week I hear from people who are frustrated by swim leg. Cycling 20 km and running 5 km are 100% achievable but surviving 400 m in the ocean seems like an impossibility. If you have experienced frustration and a part of you knows that there must be a better way then you are ready to take your next step. On a bicycle your legs apply power to turn the cranks, the chain turns the rear wheel and you go forwards. To go faster you turn your legs faster or use a higher gear to supply more power. There is a direct relationship between power and speed. More power means more speed! Swimming is not the same. Sometimes the most ‘powerful’ swimmers waste 90% of their energy thrashing and splashing their way through the pool. The most skilful swimmers apply their effort more deliberately and make it look easy. Less bubbles, less noise, more glide and more forward speed. You don’t have to be an Olympic swimming coach to see and hear the difference. Reason 1: Arm speed is not the same as speed through the water. Slow Down so you can feel what is going on! Most people can walk a long way. You might only have time for 30 minutes along the beach or you might get hungry after 4 hours of bush walking but you certainly don’t get exhausted after 2 minutes! So what is so different? As a human being you also have thoughts and feelings. You may not be aware of them but you still have them! If you had a traumatic experience with water or learning to swim as a child this may be more obvious but the truth is that all of us have an important safety mechanism which is there to prevent us from drowning. Water is dangerous. As you lose contact with the ground your unconscious mind switches into survival mode. You might feel tension in your body or you might feel outright panic set it. Unless you super relaxed and love the sensations of being super relaxed then you are probably somewhere in between those two extremes. ‘Fright or Flight’ mode is activated a lot or a little. You feel like you need to keep your head above water, you work hard to counteract the sensation of sinking and swim faster to ‘get to the other end’. Phew! Made it! Is it still a mystery why you feel spent after a single length? In our walking analogy this would be like trying to outsprint a pack of hungry wolves! Reason 2: You are fighting the water. Take away the hill & stop running from the wolves. Stop Fighting! … and besides, there is a lot of water in the ocean so you are unlikely to win anyway! Save your energy for moving forwards. 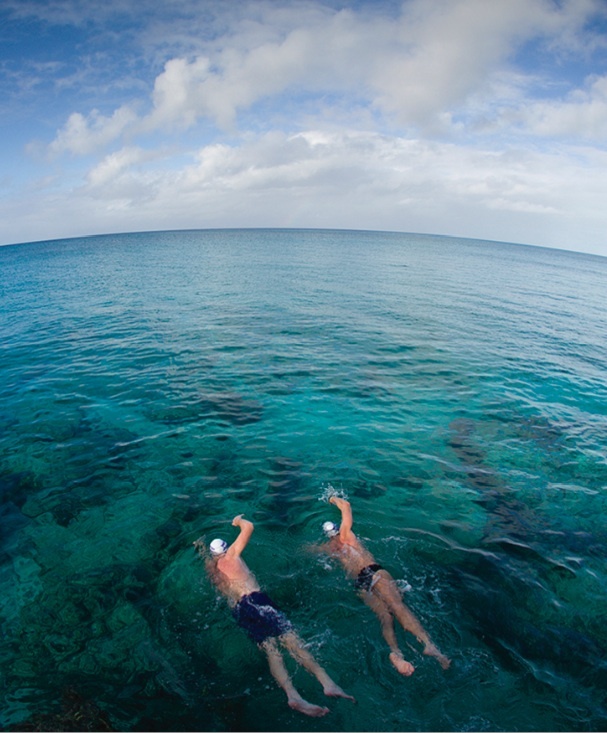 Your first step is to learn how to be more relaxed in the water. What you need to do is to build a better relationship with the water so you can develop the skills you need to be a more effective swimmer. Here are some simple steps you can take right away. 1. Allocate some regular time to work on your swimming. 3 x 30min sessions per week is a great starting point for learning new skills. Schedule them into your diary to strengthen your commitment. 2. Embrace the challenge. You may feel nervous or frustrated. That is fine. It is just a sign that you are working on something that challenges you. There is no such thing as ‘getting it wrong’ and you are either working on your swimming regularly or not. Your Choice! 3. Keep track of your progress by writing in a journal or note book each week. This will help you to see your improvements when you look back. 4. Start to feel what is happening in your stroke. Are your arms moving too fast? Where is your energy going? Are you fighting the water? Can you feel how your body moves through the water? What does it sound like? 5. Try something a bit different. There are plenty of different swimming drills that will change the way you swim. Can you feel a difference after the drill? A favourite of ours is ‘Jellyfish’. Breathe in and float in the water. Allow your arms and legs to dangle down like the tentacles of a jellyfish. Let your head hang heavy and nod it to check that your neck muscles are relaxed. If you are in the ocean then allow the swell to move your limbs around. Feel the support of the water. Don’t resist anything. Allow yourself to sink as you exhale if you do. If you don’t then that is fine too! 6. After any drill go back to your swimming and see what difference you notice. Are you more relaxed? Can you feel the support of the water? 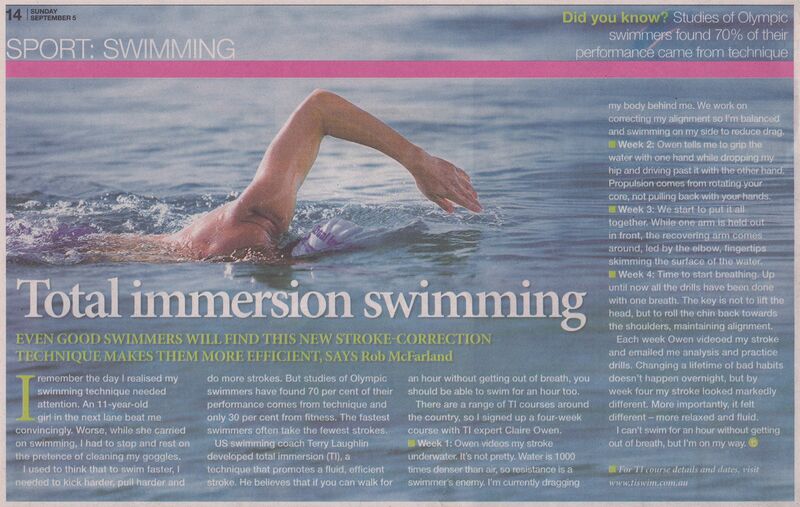 Are you flowing more easily in your stroke? Are you less out of breath? 7. Let me know how you are doing. What differences do you notice in your swimming? Do these ideas make sense? Leave a comment to say how you are going and ask any questions. In the meantime swim well and live well. PS The next article in the series will teach you how to get balanced in the water. You will learn how to glide further and lengthen your stroke. Here is the article from 5th September in case you missed it! Just listening to all the information can leave you confused! Each level builds on the previous one. Its hard to glide through the water if you feel like you are about to sink. You can’t have rhythm and flow without propulsion! The wider each layer of the pyramid the easier it is to build the next layer. What is ‘0. Relationship With The Water’? Are you working with the water or are you fighting it? Does your effort help you to go forward or are you wasting energy creating bubbles, splash and noise? Is your stroke relaxed? Do you go faster when you work harder? Does your ‘easy pace’ feel easy? Concentrate on feeling the support of the water. 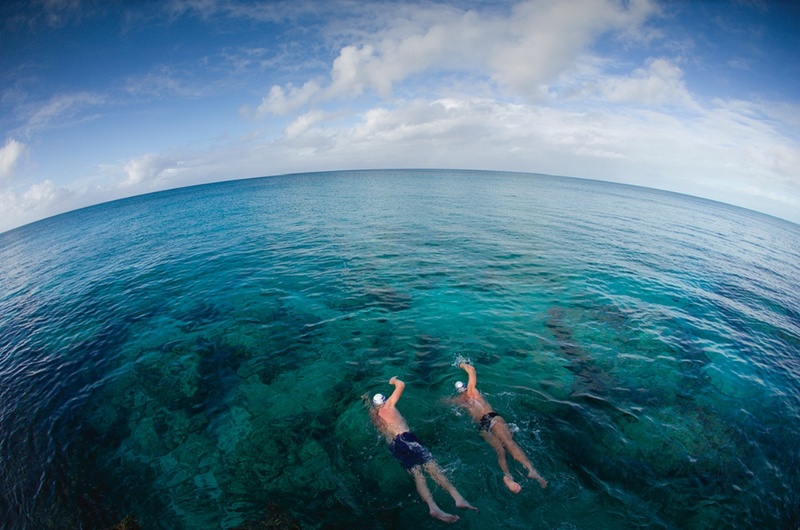 99% of people are naturally buoyant with some air in their lungs. Enjoy this sensation! Yes absolutely. Some coaches teach a long, gliding stroke. Others teach a short, choppy stroke. Instead of thinking ‘Should I glide or not?’ start to feel ‘how much glide’ is optimal for your speed and effort. In a 50m sprint there isn’t a lot of gliding. At longer distances you see a lot more glide. If you don’t have the skill you have no choices. Learn to glide at cruising pace then modify as your effort increases. Optimize time, effort and stroke count by measuring them. Eventually you will learn to feel exactly how much to glide. What about the ‘pull through’? Its not in the pyramid? Its part of level 2 which is all about propulsion. Most swimmers are taught the ‘kick’ and ‘pull’ as two separate actions which often results in poor core engagement, lack of coordination and a loss of forward propulsion. Work with your whole body and you can engage the whole kinetic chain including your lats and core to connect from fingertip all the way through to core! Instead of ‘pushing water backwards’ aim to swim your body forwards past your hand with power from your hips. How about ‘high elbow recovery’? Is that a good idea? Is this the only model for swimming skills? Is it perfect? Of course not! No model is perfect and most ideas have limitation. A better question is whether it is useful! At TI Australia we use the pyramid to help people to understand what they feel, hear and see in their swimming and to identify key areas for improve. Effective propulsion (level 2) is really important but it won’t help you much if your legs are hanging down at 45 degrees. That is why learning to balance (level 1) comes first. Do I have to be perfect at each level before I move on to the next? No no no. Don’t fall into the ‘perfectionism trap’! Once you have done some work on each level then move onto the next so you end up with a full range of skills. Just remember to keep on going back to basics until you are feeling relaxed, balanced, powerful and flowing! Remember that the wider the base of your ‘pyramid’ the higher and better you can build it. Can you help me to learn using this system? Our Demo Course will give you a taste of the first 3 levels and some powerful tools to start to bring them into your stroke. The Fishlike Freestyle Workshop teaches all 5 levels of the pyramid. Click on the names of the courses for more information and course schedule. Sue can run 10km quite comfortably in under 50 minutes and can’t understand why she gets so out of breath that she has to stop after 100m in the pool. She and she has called me to see if I can shed any light on her predicament. The good news for Sue is that she isn’t alone and hearing this seems to reassure her… Once I have found out a bit more about her swimming I begin my explanation of how swimming can become sustainable and eventually feel ‘like taking a walk in the park‘. Congratulations to our prize winners who each won a copy of our Easy Freestyle DVD. I’m on my way to the Post Office with a sackful of goodies! There were 10 DVDs up for grabs and we had 11 entries. I didn’t have the heart to choose so I decided to throw in another DVD so no-one has to miss out. I hope that you all enjoy watching the DVD and learning Fishlike Freestyle! If you missed out on this competition click here to sign up to our newsletter for future promotions!